Treviso: The coffee shop would have been at home in so many other countries. But it certainly didn’t seem Italian. The first oddity was the menu, which included cold brews and pour-overs that are commonplace in Washington, D.C., or Tokyo — but almost impossible to find in Italy. The next anomaly was the bar counter. Italians typically down their espressos while standing. This counter had seats. Then there were the prices. Even in the poshest parts of Rome, an espresso — “un caffè” — sells for 1 euro, or a little more than a dollar. Here, it went for 1.50 euros. Other drinks ran as high as 3.50 euros. When I walked into Labb Caffettin for the first time two months ago, a barista sporting an apron and a thick beard took my order, served my drink and talked a little about how the store was trying to introduce specialty coffee — call it artisanal, craft, pretentious or delicious — to a country that all but created the caffeinated life. “The Italians don’t know they are drinking such bad coffee,” Matteo Campeotto said, lowering his voice in recognition that he was treading on sacred ground. As a relative newcomer to Italy, I wasn’t ready to proclaim that the country that invented and perfected the espresso machine has been doing it all wrong. But already I’d been wondering why the modern coffee era, with its new brewing techniques and specialty beans, seemed to have largely passed Italy by. Most Italian cafes are coffee time capsules. The prices are right out of the 1980s. Old-time signs like “snack bar” often adorn the front. Their soundtrack is the chatter of customers and the clatter of porcelain cups. They are part of the neighborhood. Before my landlord handed off the keys to my rental apartment, she told me about the cafe across the street, describing with surprising detail the bar owner, his family members and whom I could expect to meet there. The espressos sell for 90 cents. Slot machines are in the back. Throughout Italy, even in the smallest towns, there are similar bars maintaining similar formulas. They tend to offer pastries in the morning — sometimes homemade, often not — and stock alcohol for the 5 p.m. crowd. Without much fuss, they serve up espresso shots that are bitter and strong. They seldom have WiFi. They do not welcome laptop workers. They never offer coffee for takeaway. And their baristas certainly never pose the kind of question that Campeotto did when I went to the Treviso shop a second time. “Do you want the single-origin Kenyan beans or the house blend?” I told him the house blend was fine. The small group of Italian rebels who are trying to promote coffee as an artisanal product say their mission is difficult in a country with the deeply held expectation that coffee be affordable for all. That expectation is born of the role coffee plays in Italian life. For decades, for everyone from bureaucrats to factory workers, coffee has been the best excuse to take a quick pause (or three) in the day. The commodity is as much the time at the bar as the coffee. Italian coffee culture is so ingrained that even Starbucks hasn’t made many inroads, opening its first store only in September in Milan. The challenge is even greater for purveyors of small-batch coffee. Italian coffee tends to rely on blends that include the cheaper Robusta beans, noted for their bitterness and lack of acidity, and common in instant coffee. Kenneth David, the Berkeley, Calif.-based editor in chief of the Coffee Review consumer report, said a few big Italian roasters use “pretty close to the worst [beans] in the world,” but Italian baristas have the machines and craftsmanship to make the most of what they have. A higher-end roaster, Illy, uses the more-prized Arabica beans, and other roasters use Arabica as a component of their blends. There are virtues that come with being a coffee drinker in Italy. One can find a decent cup of coffee almost anywhere, even in the smallest towns. And the notion of a cafe as a gathering place feels like the best kind of throwback, possible only because people don’t sit down with their ear buds and laptops. But there have been times since moving here when I’ve yearned for the advances of the hipster coffee world. The cold brew is a lovely summer drink, smoother and less acidic than conventional iced coffee because of how it is made. Italy’s version of the cold summer drink is the shakerato, an espresso shot shaken with ice. But it’s face-puckeringly bitter. Italian bars try to cover up the taste by adding sugar or simple syrup. By the time I returned to Labb Caffettin, I’d tried a few other specialty coffee shops. But Labb is particularly focused in its purpose. It serves no alcohol and offers no food, other than a few pastries. The interior is all whites and pale woods, with a chalkboard sign announcing the single-origin beans of the day. The shelves behind the counter resemble a chemistry lab. There are beakers of various shapes and sizes for making drinks. There’s a stainless-steel kettle that can be programmed to boil water to a specific temperature. There’s a scale that can sync with an iPhone. Campeotto, the 25-year-old ba­rista, fell for non-Italian coffee after trying it in Melbourne, Australia. But the store’s owner, Michele Carisi, 51, rarely travels. He doesn’t speak English. He grew up in a town of 1,000 where, until several years ago, he operated a cocktail bar in an old osteria — a space that typically serves simple, inexpensive fare — that had been in his family for generations. He said with a squinty smile that it was like a bad joke that he’d become a purveyor of any global trend. One day, though, he read an article online about Intelligentsia, the single-origin coffee roaster. The underlying idea of the article came as a jolt: that this ordinary, daily drink might be vastly improved. Carisi ordered a bean roaster, even though he had no idea how to use it. He introduced himself to bean importers across Italy. He started learning the trade. 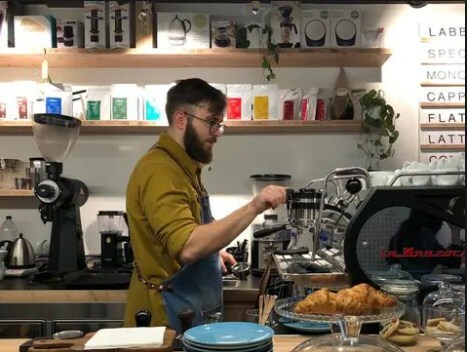 He converted his cocktail bar into a third-wave coffee shop five years ago. He opened a second cafe in Treviso last year, on a winding street with boutiques and foot traffic. The first time I visited Labb, there were few customers. Cam­peotto said some people walked in, saw the prices and walked out. But on my second visit, business was better. One customer specified the acidity level he wanted. Another liked the drink she ordered and bought a bag of roasted beans. Whether serving cortados or pour-overs, Campeotto talked to customers about where the beans came from and the flavor notes they provided — a strategy he said was necessary to justify the higher prices. Carisi was vague when asked about whether the business model was working, but said he wasn’t “going to be driving around with a Ferrari.” He runs a roastery and distributes beans to a small number of local restaurants. He also hosts third-wave coffee events. Still, he said, the cocktail business was far more lucrative. “This is the most difficult place in the world to open a coffee shop like this,” he said. There are 1,000 coffee shops like this in London, he said. But those places aren’t trying to upend tradition.